Finding Land Grants – Find Grantee’s surname and date of grant >> Search surname initial in appropriate index >> Find serial and page number >> search serial number in register of land grants >> use page number to find initial land grant. Finding original portion plans – Understand that O.R. 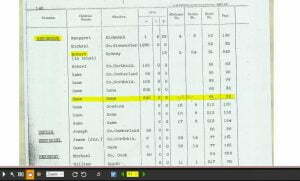 indicates old roll and can be searched under crown plan 1. Historical searching can be important in the correct definition of the cadastre and no definitive information exists to aid the surveyor in searching for documents that may be required. To correctly determine whether a parcel of land extends to the centre of a creek, it may be necessary to obtain the original land grant. Similarly, road plans and original portion plans may be required in areas where little or no recent survey information exists. Sometimes the required information can be easy to find, however, older sources can often use unusual terminology and referencing to indicate the location of the desired document. 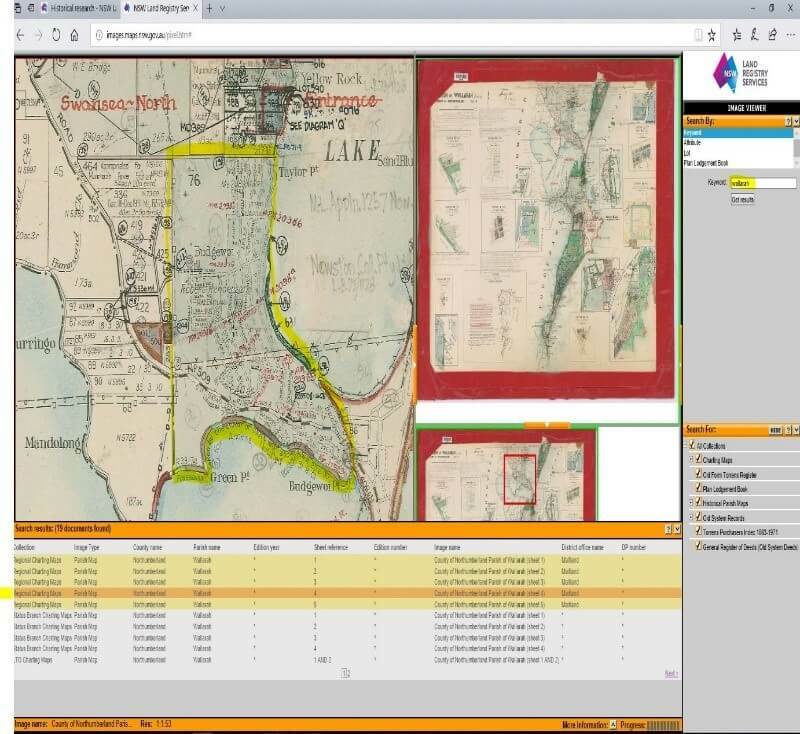 Historical Land Record Viewer (HLRV) offers access to parish maps, land grants and many other images and documents that can be helpful if you know how to find them. Land Registry Services (LRS) do offer a significant amount of information on their website, but the documents must be thoroughly read to be of much assistance and this if often not practical while attempting to search a project that is underway. The following is a case study that illustrates how to correctly obtain the original land grant along with the original plan of survey for a parcel alienated in 1841. Portion 76 in the parish of Wallarah has been selected. The most recent parish map can then be selected. The name of the original grantee is indicated on the parish map within the portion to which it pertains. In this case Robert Henderson. The date 11-8-1841 indicated in the “Parish Numbers Used” Table below indicates the date that the original grant was issued. 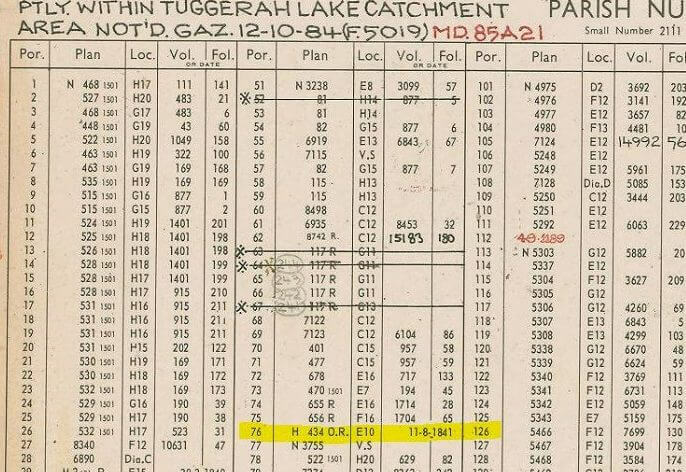 Figure 2 above, used in finding the original survey plan, tells us that the grant was issued in 1841. As the Torrens system was introduced in 1863, we know that the grant will be in “Old System Indexes” rather than “Torrens Purchasers Index”. This means all other tick boxes in HLRV can be deselected and the Initial H for Henderson entered in the search bar. See Figure 3 below. Once the correct image is identified based on the applicable date range, the correct sheet can be found as the image is in alphabetical order. In this case sheet 11 shows Robert Henderson’s grants. The parish map indicates that the grant was for 640 acres so we find that the grant can be found using Serial No. 61 page 60. 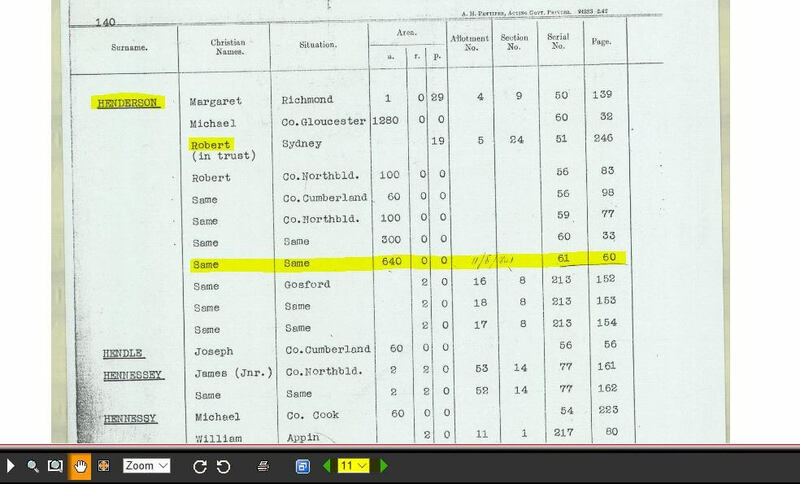 Now 61 can be searched with only “Register of Land Grants and Leases” selected and page 60 found.Page 60 will be the original land grant shown in figure 5 below. The grant provides the meets and bounds description as well as any reservations and conditions. Unless the bed of a watercourse is reserved within the “AND WE DO HEREBY RESERVE UNTO US” section of the grant and providing the parcel was alienated prior to 3rd Mar 1918, a claim may be made to the centre of the watercourse. 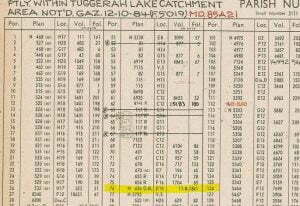 Usually the “Plan” column of the Parish Number table shown above in figure 2 will show a number with no letters adjoining it and can easily be searched using crown plan 123-2111 where the 2111 is indicated as the small number at the top of the table. In this case we have H 434 O.R. “Searching the Registrar General’s Maps and Plans” – LPI, March 2013 indicates that O.R. represents Old Roll. Old Roll means that searching crown plan 1-434 will give the correct result. There is no documentation indicating that you should search 1 for old roll plans, this knowledge was provided by Brian Mott. Likewise, R indicates “Roll Plan” and perhaps a similar search would work. There does not appear to be any information regarding the meaning of prefix’s such as “H”. 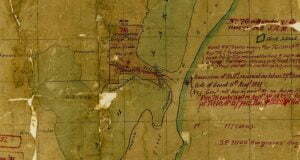 The search yielded a plan signed by surveyor Ralfe in 1830 which encompassed what must have been the original grants for the entire central coast. Interestingly, John Slade is noted as the owner in figure 6 below but by 1841 when the grant was issued, Robert Henderson was the original grantee.